See also les Canons (Free) and an interesting article on this piece of music. La Poupée (Free) from "Jeux d'enfants"
Edited by Dale Tucker. Piano solo: Advanced Piano. Level: advanced. 8 pages. Pour Tenor et Piano : PER PIETA NON RICERCATE K420. Extract : "je suis grise"
Stabat Mater .I could not find it free.This site tells all about StabatMater across ages. Scènes de la forêt (Paying) on di-arezzo. Nocturne for the Left Hand Piano Solo. "Sibelius' Suite Mignonne is original for 2 flutes and strings orchestra. 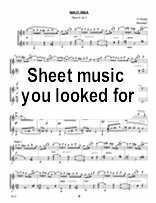 I don't know the work, but suppose that the flutes may have some solo role,and hence a version for flute(s) and piano has been made, there is nothingmentioned about a such version in the works list. But Sibelius himself arranged the work for solo piano.